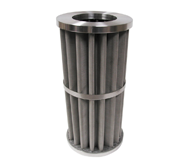 Fine Particulate Filter Elements for Gas or Liquid with Posi-Sealoc II® or bolted cover and “Out to in” flow path. Notes: Dimensions are subject to change without notice. Other Materials of construction are available. Please consult the TM Sales Department or your local sales representative for certified drawings or to discuss interchangeability with GFC Elements.